Is that a bike in your pocket? Deciding that we were going to buy folding bicycles for our birthdays was the easy part for Wessel and me. Choosing the bikes is the challenge. 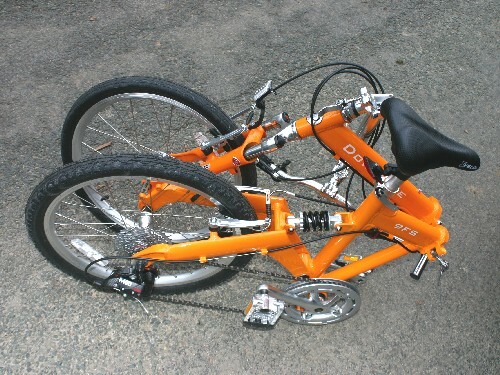 For those of you who have never seen or heard of a folding bicycle, the name pretty much sums it up. Some fold quicker than others, some are more comfortable for long-distance riding, some are lighter, some fold smaller. Prices range from $400 to $4,000 and up. So many options, so many opinions! Argh….Some people use their folders for mostly commuting — hopping on and off buses and trains with their bikes in hand. Wessel and I are more interested in having them for our many travels, especially when we fly, whether domestically or overseas. The money we fork over for the occasional rental or oversized luggage shipping of our own bikes could pay for folding bikes in five years or so. While there are many good folders out there, the Bike Friday brand in Portland, Eugene, Ore., always rises to the top. The closest BF dealer to us, Neighborhood Transportation, is a couple hours away, near Winston-Salem. So we brought the store to us and made a party out of it. Owner Bruce Hermann was kind enough to bring several bikes for us to try out in exchange for me inviting the local cycling community. Think of it as the bike version of a Tupperware party. Bruce’s other thing is recumbent bikes, those low-riders that stretch your legs and let the rest of you rest, so he brought a few of those as well, both two wheel and three-wheel models. I loved the three-wheeler. No balance needed! I have several friends who ride recumbents in traffic, but I’m still not up for being that down. For overall style, I loved the Bike Friday Pocket Rocket Pro, which really is more a road bike than touring bike, and I really need a touring bike that can go on a variety of terrains. So forget the Pocket Rocket, which starts at $1,700. Just as well. For me it’s down to the New World Tourist, which starts at $1,100 and the Pocket Crusoe, which starts at $1,400. The PC does a little more of what I want, but, oh, I just can’t decide. Much customization is available, meaning more options. ARGH…. Custom colors are another $150, which I think is way too much. But I so prefer purple to red. The only way I can justify any of this spending is to not look at my end-of-year financial statements. I will add that cycling is by far my top activity, and my newest bike is 12 years old. Does that help? Of course I could check out used BFs, which means even more research. 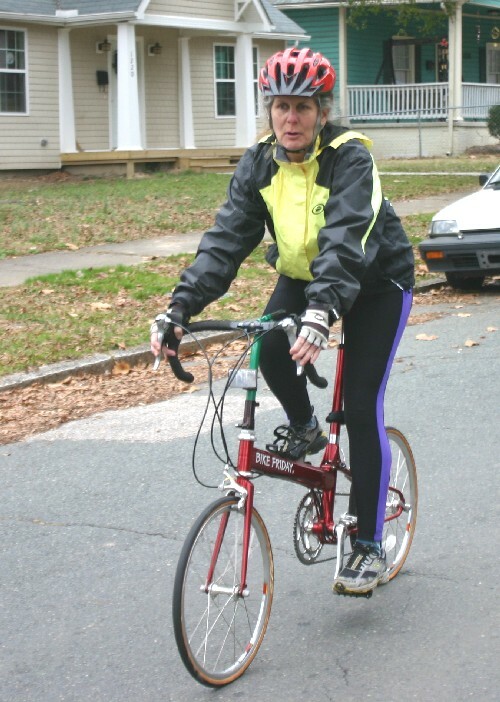 Maybe by my next birthday I’ll have my folding bike. Wessel, who is both more budget-minded and less name-brand inclined, is likely going with one of the Downtubes, which costs around $400. And it’s orange! Of course it would make so much more sense if we both had the same bike, but since when do we do things because they make the most sense? Click here for more photos of folders, recumbents, and friendly folks modeling during our folding fest. This entry was posted on January 19, 2009 at 10:55 am and is filed under Air travel, Bicycling. You can follow any responses to this entry through the RSS 2.0 feed. You can leave a response, or trackback from your own site. I thought BF was in Eugene? Freak! You’re right. Can’t believe little-miss-fact-checker-journalist me did that. Will fix. Thanks! Why don’t try to get an advise from the consumers-organisation (whatever the name of such an organization in the US is). Our own experience, when our kids were young, was: a funny thing on the camping site, to go shopping to the grocery or when you’ve made a trip by train to make the last few miles on your pocket-bike. But making a convenient trip on it ???? But like Obama says: we need change. Perhaps these things have changed already. And: dreams are allways exciting. I’m actually an employee at NYCeWheels (http://nycewheels.com), a New York City folding bike dealer. I happened to stumble across your posting and decided to give you my two cents. First, decide exactly how the bike will be used and why you’ll be folding it. This will greatly narrow down your search. Folding bikes like the Xootr Swift Folder, the larger frame Dahon bikes (like the Matrix), some of the Reach bikes, and others are great and all fold well enough for the the trunk of your car, your apartment, elevators, and so on, but not quite compact enough for other purposes. They do, however, often offer a full-size fit and feel. You mentioned the desire to fold your bikes for travel. Generally, when it comes to transporting bikes by airplane, the more compact the bike the better. 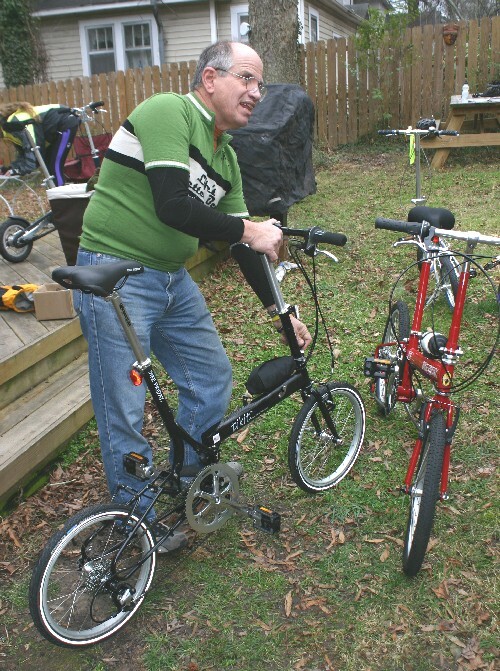 The more compact folding bikes can also be taken onto other forms of transportation, into stores, and so on. In this range, you’d want to look towards some of the Bike Friday models, some of the Dahon models, and especially the Brompton models. Bromptons are extremely popular, so you shouldn’t have an issue finding one locally to test ride. Thanks for your two cents. I’d say that was worth at least a dollar! 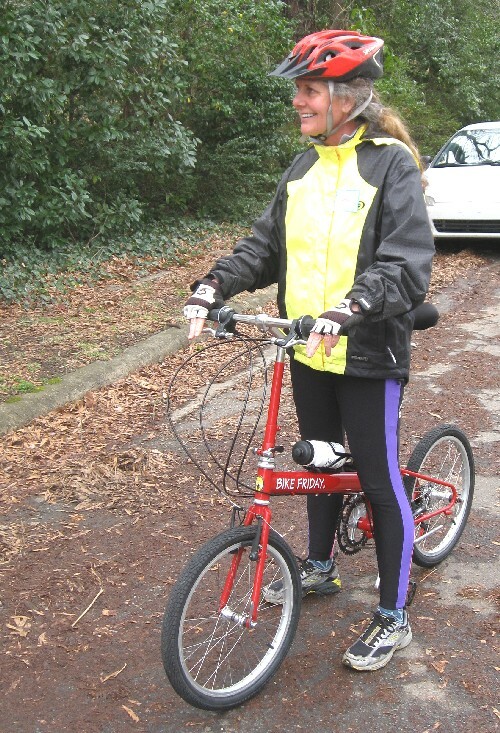 I’ll look into Brompton, but here’s a question: how are they for distance riding and for potential loaded touring? We typically ride 20 to 60 miles when traveling. Obviously for touring one needs equipment, attachments, what-not, but it’s important that our bikes can do that. For instance, Bike Friday’s tikit is a very fast folder, but it’s not great for long-distance riding. Pretty weird comment. The tikit is actually quite a good long-distance bike; widely recognized as *much* better than the Brompton in this regard because of its customizable geometry, customizable components, and far wider gear range options. Thanks for that input. I’m embarrassed to admit that we haven’t yet bought our bikes! And, yes, we still plan to. It was a busy year. Is that a good excuse? The nice things about these bags is that they are easily removable and that they mount to the frame and not the handlebar, so the weight does not shift with your handlebar as you steer. The rack should be able to hold 25 lbs safely, if not more. The front-loading carrying bags are quoted at about 20 lbs as far as the maximum safe weight goes. All of that said, Bromptons are very popular and usually available from a good number of folding bike dealers, so you should see if you can find some to see and test out locally. In the end, it’s hard to say if it’s the right bike for you until you get on one and take it for a spin.